The problem might be with AudioLabel; although, we have other customers printing directly on the disc using the Canon Pixma MG5450. I wanted to double check everything, so I downloaded and installed the latest print driver for MG5450 on a Windows XP computer. I also installed the trial version of AudioLabel 5.00 Build 7. 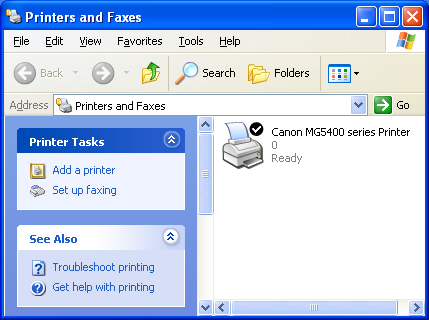 I deleted all the other printer drivers on the Windows XP computer, and only installed the Canon MG5450 print driver (as shown below). I was able to start AudioLabel, open the Print Dialog, and select the MG5450 printer (without the "Printers Offline" message). If there was a problem with MG5450 print driver, AudioLabel should still be able to read other print drivers. Do you have any other print drivers installed? If not, could you install another print driver and see if AudioLabel recognizes it? Windows has options to install pre-loaded print drivers (from Epson, HP, Canon, etc.) in the Printers & Faxes section. Please note that AudioLabel will need to be closed and opened after any changes to the print drivers. 1. When you see the MG5450 driver listed in the Windows Printers & Faxes section, is the printer status Offline or Ready? 2. Do have any anti-virus or security software that might affect this? 3. Are you logged into Windows with a normal account (administrative privileges), or a Guest account? Just does not work with my printer, tried other printer drivers & still getting the same message. using eset32 antivirus & commodo firewall , they seem to be running ok. I am logged into windows normal account. When the printer is on, the printer icon in printers & faxes is highlighted with the tick (ready). My canon printer is working fine with every other program &emails etc , i just can't see win xp being the problem. When i format my pc again i will try Audiolabel again. I was hoping somebody out there might have a idea whats going on . As another test, I installed the Eset32 antivirus software on the Windows XP computer to see if that would stop AudioLabel from reading the print drivers. However, I was still able to access the MG5450 print driver through AudioLabel, and did not get the "Printers Offline" message. We are still trying to duplicate the problem here. Have installed another software program. it picked up my printer no problem , i think there must be a problem with the AudioLabel software. Thank you for your help and patience on this matter. I have notified our lead developer about this issue, and hopefully he can recreate this problem and find a solution. 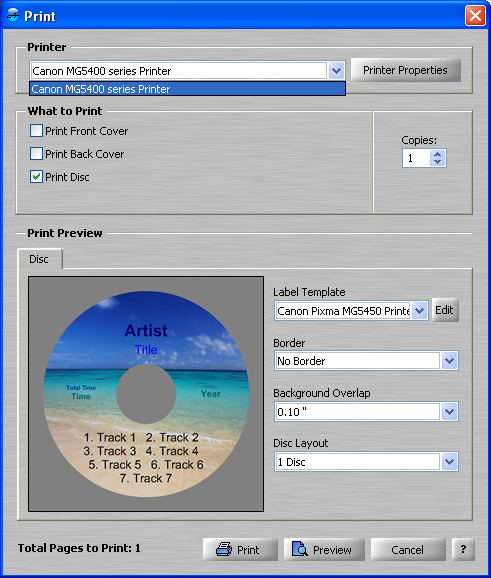 Just found out that Canon CD Label Print works with my printer , i used to use this program with the Canon ip5000. I have the same problem. I just upgraded hoping that it would fix the problem, but didn't. Printer works fine with everything else. I run refedit to remove all of the AudioLabel and reinstalled, same results. Even deleted the printer and reinstalled. HP C410. It worked great before. 1. What operating system are you using? 2. Is your printer connected directly to your computer, or is this a network printer? 3. What is the exact error message you get when trying to print?